FOR IMMEDIATE RELEASE: Bangor, Maine (January 18, 2019) – New England Fights (NEF) will hold its next mixed-martial-arts event, “NEF 37: Sub Zero,” on Friday, February 1, 2019 at the Cross Insurance Center in Bangor, Maine. Earlier today, the promotion announced the full fight card for the event. In the main event of the evening, Josh “Hook On” Harvey (5-0-1) will face Bill “Jonesi” Jones (13-10) for the vacant NEF MMA Professional Featherweight Title. Harvey is coming off a very controversial majority draw in Massachusetts last fall against UFC veteran Joe Giannetti (6-1-1). Many observers felt that Harvey had dominated Giannetti for three rounds and Giannetti was only saved by a hometown decision. Prior to that time, Harvey had a perfect professional record with five straight wins in the NEF cage. Bill Jones is a pioneer of the New England MMA scene. Jones, a member of Nostos MMA, vanquished Matt Denning (5-8) last spring at “NEF 33” in Portland, Maine via second-round technical knockout. Havey’s Young’s MMA teammate CJ Ewer (3-2) will be in action in the co-main event against The Academy’s Mark “Pockets” Gardner (0-0) at a catchweight of 180-pounds. Ewer is the reigning NEF MMA Professional Middleweight Champion. Gardner makes his pro debut after a stellar amateur career that saw him finish all three of his opponents. 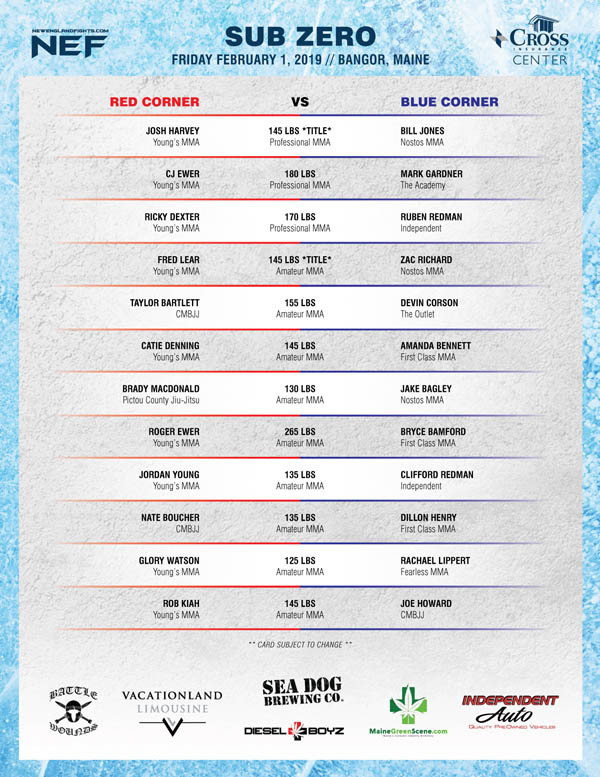 Ricky Dexter (1-0), also of Young’s MMA, rounds out the professional portion of the card against Ruben Redman (0-2) in a welterweight contest. Both fighters have not competed in the cage in two years. Dexter is the former NEF MMA Amateur Welterweight Champion. Fred Lear (6-2) will headline the amateur card with Zac Richard (3-0) in a bout for the vacant NEF MMA Amateur Featherweight Title. Lear has previously held the amateur bantamweight strap and will look to make NEF history as the first athlete to win titles in different weight divisions within the promotion. Zac Richard was voted the “2018 Rookie of the Year” by NEF fans after cutting down all three of his previous opponents in the first round last year. Also featured on the amateur portion of the fight card will be two women’s fights. “2018 Rookie of the Year” runner-up Glory Watson (2-0) will face her toughest challenge to date in the form of Wisconsin’s Rachael Lippert (4-2), while Catie Denning (1-1) takes on the debuting Amanda Bennett (0-0) of First Class MMA. Watson and Denning are two members of the group known affectionately among teammates and fans as “Chris’s Angels” as they train under Chris Young at Young’s MMA in Bangor. Tickets are sold-out at the box office and Ticketmaster, but fans can still contact NEF through its Facebook page, “New England Fights,” as the promotion still has a very limited number of tickets available for direct sale. Tickets will be sold on a first-come/first-served basis until they run out.